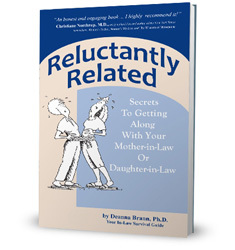 I received an e-mail asking me if I wished to review Reluctantly Related: Secrets To Getting Along With Your Mother-in-Law or Daughter-in-law and there was no way I could refuse it! I mentioned recently that the in-law relationship is not one that it written about frequently or discussed very much. (At least, it's not talked of politely most of the time!) I know that learning how to grow a bond with in-laws can take a lot of time, effort and hard, hard work. And prayer. It would be nice to see these relationships addressed well. I am ecstatically happy to say that Reluctantly Related handles the subject of the mother-in-law/daughter-in-law relationship quite well. I love that Brann begins her book by pointing out why it is that this particular relationship can be so fraught with misunderstandings and miscommunication. In short, most often you choose your own friends for yourself. In the case of an in-law, you aren't really choosing them but you are being called upon to be close to them and share life with them, regardless. Other friendships tend to develop naturally and over some period of time. In the case of a MIL or DIL relationship, it comes together as a result of the decision of a third party and the MIL and DIL find themselves in an incredible situation of needing to figure out how this relationship is going to work well - and fast! Brann likens this to "entering a three-legged race with someone who is much taller or much shorter than you are." In other words, it can be awkward and strained as you are learning who the other person is and how they now fit into your world. Brann makes clear that a MIL is an older woman who is (most likely) the more mature of the two women in terms of life experiences. She is likely the one who is more secure in who she is as an individual and so it can be hard for the MIL to treat the DIL as an equal for the simple fact that the MIL tends to view the DIL as young and naive. While this is true, Brann also recognizes the importance of understanding that the DIL has lived some life (though not as much) and brings her own, unique experiences to the drawing board. The DIL cannot be discounted as a person or treated as anything less than an adult as a result. That to say, Brann spends some time presenting the challenges these two marvelous women face when they come together to be a part of one man's life. She then proceeds to offer some character sketches and typed personalities both for the mother-in-law and the daughter-in-law. She does this by offering examples of four particular personalities that you might find in a MIL and then a DIL. The reader is encouraged not just to find the personality that best suits them but also the one that they believe their counterpart believes best suits them. Relationship through understanding is what Brann is driving at in this book. She essentially wants her reader to "be slow to speak and slow to anger" so that they can learn who the other person is as an individual. She wants you to remember that there is likely always something about the other person (be it their life experiences or personal emotions) that you do not know so taking time to ask questions and be patient is of great importance. A good relationship between these two women is completely possible, but it will take a great deal of work. (And prayer!) Anyone who is married knows this to be true, no matter how perfect the relationship is or may seem to be in various moments. Things come up that need dealing with and if the opportunity exists for both parties to talk through issues and work on improving their communications with one another, there is blessing in store. I would love to have been able to read this book alongside my MIL when Jonathan and I married. Reluctantly Related would have been incredibly useful to us and to Jonathan also. I can pinpoint my MIL's personality and my own in this book and see where we made mistakes. Gratefully we had good communications when she passed away several years ago. At this point in time, I cannot correct mistakes or have a "do over." I can only learn from my mistakes -- alone. That feels a bit unfair, but it is as God fashioned it and it is better to learn from my mistakes than re-create them! As Brann points out, the chances are very high that both women truly do desire to have a good relationship with one another. The problem is, they don't know how to get there. There are so many questions to answer, so many things to know about the other person. Again, it is a relationship that takes time to grow. It takes patience and a boatload of consideration. There are moments in which one or both parties might fail miserably but, especially as Christians, we believe that there is grace and we must live as we believe that. Certainly some issues create more conversations than others but a willingness to succeed at the relationship can take you very far. (More so your willingness to lay "self" at the foot of the cross and see what God might have in store for you if you develop this relationship.) And, as the author points out, the worst relationship can be turned around. Many thanks to The Cadence Group for sending a copy of this title my direction in exchange for my honest thoughts. I honestly recommend this book because I loved it! Further thanks to them because they have arranged to giveaway ONE copy of this title to one of you! Care to win it? Simply leave a comment below, including a valid e-mail address! This contest is open to US Residents only and will be open through Monday, June 10th. I feel a little awkward entering a drawing for this one--since I am not at all reluctantly related to my mother-in-law. I didn't know her prior to Daniel's and my engagement--but I was utterly charmed by her when we first met and have been supremely blessed to have a mother-in-law who I get along with very well indeed. I need this for my Mom and sister-in-law, who are currently living in the same house! I'm curious now! I am both a daughter-in-law and mother-in-law to two love women. When our oldest son married, they lived one mile from our house. I was so afraid of being intrusive that I probably erred on the distant side. Fascinating. I would be very interested to read this book to help shed some light on the, um, dynamics we experience. And I have a friend who REALLY needs some insight in that area. This sounds like an excellent book, not just for DIL-MIL relationships but perhaps to shed light on many woman to woman relationships! Enter me, please! I really wish this book had been out 8-9 years ago. It sounds like a blessing! This does look interesting. I've noticed that, despite the conventional wisdom (and a funny song from the 60s) it is much harder for a daughter-in-law than for a son-in-law. (I really like my mother-in-law, and am blessed to have added her to my family.) There are just so many more expectations placed on women. I particularly recognized the difficulty you mentioned in treating a younger woman like an adult. So very true. What a great topic. I have a daughter-in-love and want/need info on how to relate to her better. She is very precious and maybe I am being too cautious about our relationship. Thanks so much for your review, Carrie.